This last week I was thinking about this passage and also was reading it with our (My Wife and I) Catechism class, which I then proceeded to give some insight on this passage. In the process of doing that the Holy Spirit inspired me with a few thoughts, and now I am going to try to articulate these thoughts on to paper. It was six days later (March 28, 2011) while I was laying in bed thinking about Jesus and was just about ready to fall asleep that this passage came back to my mind. I could not stop thinking about it, and all the thoughts started flooding in and the Holy Spirit urged me to get out of bed and start typing, and it is about 11:30pm. I will list the part of the Gospel and then put my reflection down after it, some (or most) of the reflection may not be entirely mine, I have been reading a lot of scripture and about scripture for the last 7 years, and the Gospels have been around for almost two thousand years, and there have been greater men and women then I, who have commented on this passage of scripture, but alas I must write this down or I will not be able to go back to bed, in the hopes of finally falling asleep. “Jesus came to a town of Samaria called Sychar, near the plot of land that Jacob had given to his son Joseph.” In our Journey back to God we always have the assumption that we are growing or moving close to Him, but in fact He comes to us. As we look at the Gospels as a whole we see that over and over again, and not only does He just come a little way to meet with us, but comes from heaven to dwell among us. So in coming to us, He comes to a place that we are familiar with, not a strange or out of place setting, but a place that we might be secure in, a place we can touch and feel, as was the stable in Bethlehem. “Jacob’s well was there. Jesus, tired from his Journey, sat down there at the well. It was about noon.” Jacobs well, for the people of Jesus’ time; this was a place of history that was deep in their thoughts and hearts, a place the new and old remembered well. Why was Jesus tired? Isn’t he God? We sometimes forget His human nature, He was one of us in everything but sin. He in fact ate and drank as well, He took on flesh, and only to better show us. Noting the time, noon, we now can put the pieces together, because in that region it was not only hot at that time, but also dry, and that is why the well was also very important, and that is why people came out to this well to draw water, because it was the nearest place to do so in that region. “A woman of Samaria came to draw water. 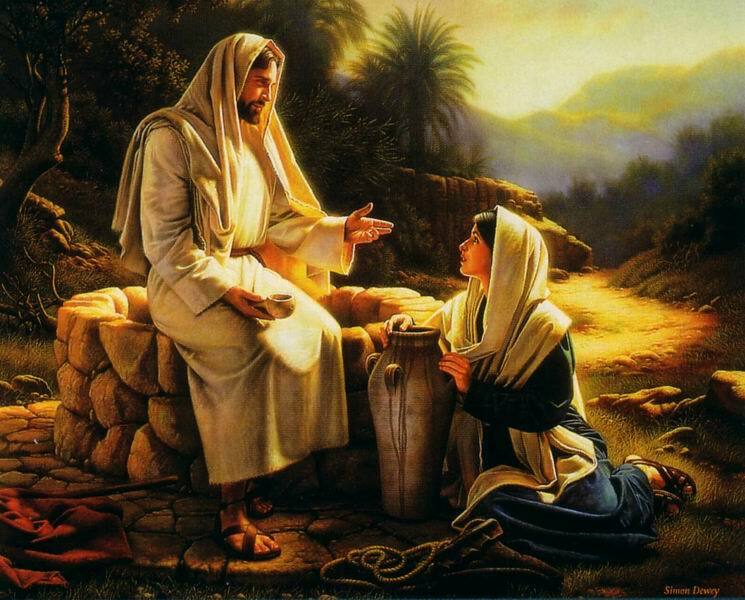 Jesus said to her, “Give me a drink.” She comes to draw water from the well, which is about 75feet deep, and naturally she would be expected to be looking down, (more on that in a little bit) and she does not see Jesus, but He sees her first, because he starts the conversation. Going back to the last paragraph we notice that it never said that Jesus was thirsty, but only that He was tired. Jesus noticing the woman, and as we will see later, knows her and about her. So he starts the dialog as he does with all of us. 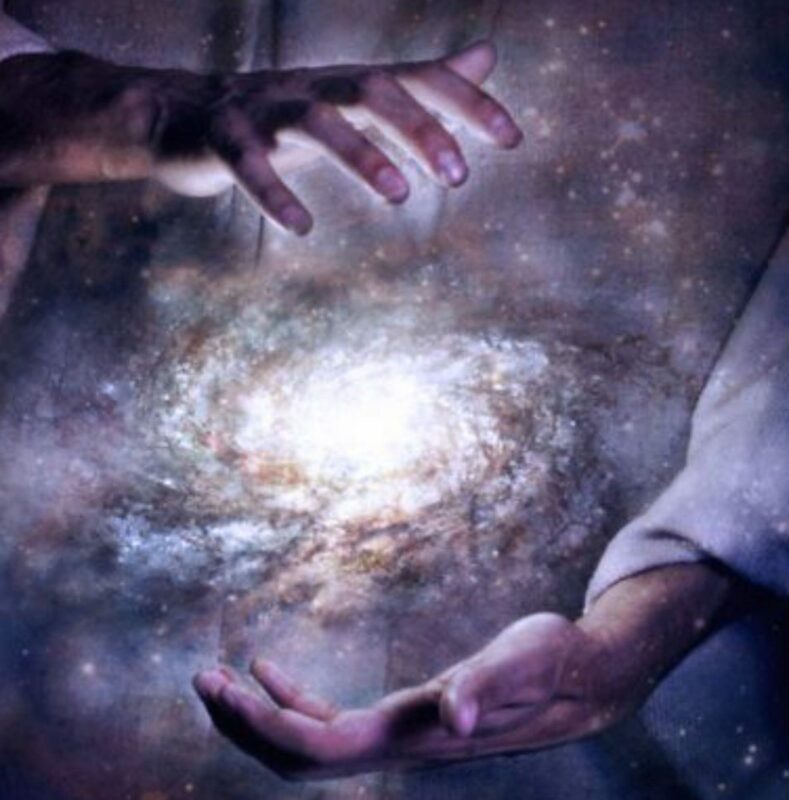 Again as we talked about before, we think we are getting close to Him, and now we think we are always talking to God first, but in fact he has been talking (calling) to us from time eternal, even before He formed us in our mother’s womb He knew us. Notice as well that Jesus does not start the dialog with I am God, but starts at a place of simplicity, and as He comes in the flesh to places we know, he dialogs with us at the beginning with things we know and can understands. A simple request of a drink of her, and nothing more than these few words, but this is only the beginning of the dialog and with these words He knows has her, our, attention. “His disciples had gone into the town to buy food.” The dialog with Jesus and the woman starts with them alone, and most of us drown ourselves in noise to avoid hearing God speak to us. When we turn off all that is around us and still ourselves that is when we truly begin to dialog with God, and we allow Him to say to us with such a few words what will stir our hearts. “The Samaritan woman said to him, “How can you, a Jew, ask me, a Samaritan woman, for a drink?” -For the Jews use nothing in common with Samaritans.- The response of the woman is like our response when we first hear His voice calling to us, we are startled, confused and cannot move from our position of indifference to God. We begin to point out that we are not like those other holy people we are way to different and we have nothing in common. Although she might be stating some facts about the Jews and Samaritans of that time period, she is allowing that to keep her from progressing those so many years, staying where she is at and not allowing herself to move any closer. I know I have done that in my life and I am sure many of us have stood back and said this is the way it is or the way I am. “Jesus answered and said to her, “if you knew the gift of God and who is saying to you, ‘Give me a drink,’ you would have asked him and he would have given you living water.”” Jesus is not content with her statement and pushes forward, escalates the conversion to the next level. He knows her and knows that she has some belief in God, and like we sometimes say to ourselves that yeah maybe there is a God somewhere, but then He gives us more to chew on, what is this gift? Who is this man? And He is going to give me something more, living water? Now we start to look at this person that is talking to us, and really look, not just a mere idea, a thought, but a true presence that we must acknowledge and try to comprehend. “The woman said to him, “Sir, you do not even have a bucket and the cistern is deep; where then can you get this living water? Are you greater than our father Jacob, who gave us this cistern and drank from it himself with his children and his flocks?”” She doubts, like we do, how can God do this or that? Just because we cannot perceive it with our physical senses, but even with that doubt she still hold on to what He said, living water, it still plays in our mind, could that be true. Then she goes on to inform Him about Jacob and the well, and talks about him as if he, without God, was able to acquire the water, but in fact Jacob testifies to the opposite. Again we hold on sometimes to just the words but not where the words come from or spoken from whom, but just stop short of going deeper. “Jesus answered and said to her, “Everyone who drinks this water will be thirsty again; but whoever drinks the water I shall give will never thirst; the water I shall give will become in him a spring of water welling up to eternal life.” Jesus does not go through history and linage about Jacob and how it was God who helped and saved Jacob, but notices what she held on to from His previous statement, living water, and now starts to escalate the dialog, raising it up to a higher level. He points out to her the physical reality of the water, and reminds her that she will be coming back to this well always with an empty jar and she, yet again, be thirsty. We try to fill the emptiness within us with other thing and not God and we know that it will never quench our thirst, and that is when God reaches in and makes us realize that what we have, and what we are comfortable with is not enough. The next part of His statement points to Him, I shall give, and now we start to look at Him even closer, because at first he pointed out God and now Himself. He goes on further and points out that not only what He gives to us will never make us thirsty, but that we will overflow with it. God will keep pouring into us, and only needs our yes to go above and beyond our wildest dreams, because not only will I be overflowing with this living water, but it will consume me to the point of eternity. “Sir, give me this water, so that I may not be thirsty or have to keep coming here to draw water.” His words go beyond penetrating our hard hearts, but changes it to something new, because now after all these years from being thirsty, she wants the water that He will provide, we want it so desperately, and in that new heart we realize that we yearn and need it. Look how far, and only this far in the dialog, the conversation has escalated to great heights. A short while ago she, we, came to look down a deep empty well. “Jesus said to her, “Go call your husband and come back.” The woman answered and said to him “I do not have a husband.” Jesus answered her, “You are right in saying ‘I do not have a husband.’ For you have had five husbands, and the one you have now is not your husband.” The woman said to him, “Sir, I can see that you are a prophet. Our ancestors worshiped on this mountain; but you people say that the place to worship is in Jerusalem.” This is a long passage, but it works all together. Jesus has not given her the living water as of yet, but request something of her. Jesus knew about her sin, but never the less we have to admit our sin, Him knowing it (for He knows all) does not change us or makes us ready to receive His gift. We have to commit to the change, we need this living water, and since now we realize the truth of that, we have to acknowledge our sinfulness and wrong doings. She, at this point understands a little more about who Jesus is, not fully, that He knows a lot more about her then she realizes. Like us, she is not ready to give all of it to Him, because in her last statement she points out that the Jews worship there and we worship here, trying to make some excuse of why she is still not fully involved, but Jesus does not allow her to stop there, as we will see. “Believe me, woman, the hour is coming when you will worship the Father neither on this mountain nor in Jerusalem. You people worship what you do not understand; we worship what we understand, because salvation is from the Jews.” Jesus gives her a glimpse of the new covenant, when the Church will not be in only one or two places, but will be all over the earth. Since she has gone from the place of acknowledging her sin, now she has to be prepared in understanding. Like us, once we realize our faults we have to move beyond that and start to learn what God is teaching us. Jesus in this part of the Gospel is not saying, oh the Jews know nothing or He is dismissing them, but goes on to inform her that what was handed down to the Jews through revelation was true, and we know He came to fulfill all. The new covenant is coming. “But the hour is coming, and is now here, when true worshipers will worship the Father in Spirit and truth; and indeed the Father seeks such people to worship him. God is Spirit, and those who worship him must worship in Spirit and truth.” As Jesus continues He points out that the hour is here for true worshipers and those worshipers do not just say I believe, or say we have the law, but it has to be both. It requires our whole being, soul, heart and mind. He reveals beyond what has been given to the nations so far, and as the Old Covenant is pointing to Him, the New Covenant not only fulfills it, but takes it to a higher and more beautiful place. A place beyond what our minds could even conceive, and as Jesus comes all the way from heaven to dwell among us, he is going to take us up into heaven to dwell with him. “At that moment his disciples returned, and were amazed that he was talking with a woman, but still no one said, “What are you looking for?” or “Why are you talking to her?” The disciples like the people in our life that see us fall in love with Jesus, they don’t know what to say. The say well this is odd or strange, but they notice something is profoundly deep and different about this situation. When I started falling in love with Jesus and came back to the Church someone I knew told me that I was just going through a fad, a phase in my life. We also know people, or we have, dismissed people’s conversion to God because we do not understand it. I cannot begin to talk for the disciples but I am sure they were taken aback by this situation, but did not say anything because they knew their master, these thoughts might have crossed their minds for a moment but they always came back to the fact that they knew who Jesus is. “The woman left her water jar and went into the town and said to the people, “Come see a man who told me everything I have done. Could he possibly be the Christ?”” Now the woman is receiving the living water from Jesus and she leaves her jar, no longer is it needed. She came to the Well to look down into, to look down inside of the empty darkness. That is how we are like before we encounter Jesus, we are always looking down for something, like the jar to fill, but when we find Him we are no longer in need to look down, because He moves our gaze from what is empty and dark below to what is fullness and light above. After that point she, we, cannot contain ourselves, we have to go out and tell everyone about Him, we are overflowing with the living water and we want everyone to have this living water. Her last statement ‘Could he possibly be the Christ?’ I take that not so much as a question from her but as a joyous statement, like I cannot believe this is true; she is so full of this living water that she is not able to contain that question within her. Like I always say to myself I cannot believe God is so amazing, how can this be possible? Our minds so finite and it is impossible to fit the infinite, but we know it is true, we have touched it and seen it and smelled it and tasted it. Our whole being stands in silence as he moves in and changes everything. I will not put in the last portion of this Gospel passage, you can do some homework and look it up, but I would like to point out a few things in conclusion. So now the woman tells everyone else at the village and they are amazed at what she is telling them and they slowly start to believe her, authentic love is infectious. So they all go to Jesus and want him to stay with them, and he does stay for two days. Then the town is in a state of conversation and they tell the woman that now they believe not because she told them but because they encountered Jesus. I will have to say this passage is now one of my favorites, and it is so deep and amazing. Someone telling us about Jesus is not enough, it is a start, but we have to go deeper. Just like the woman got to know Jesus personally, they also had to know him personally. Jesus saves us as one at a time and not in a crowd, we have to be moved and touched by Him. He has to work with each of us to transform us from within. Others giving us words and testimony can only get us so far, but then the reality of Jesus has to penetrate us. He has to take us from looking down into the deep, empty and dark well, to looking up at Him. So he can give us what we want and need. I pray that all will come to know Him and Love Him so that all of us can share in the living water that comes from Him and we will never thirst, and a spring of water will well up inside of us to eternal life. Amen. Next PostNext Advocating (Voting) for Evil?